Under Armour's Test of Will 2018 Challenged Me! Four challenges. One minute each. Under Armour Test of Will 2018 has proven itself to be a real challenge and at the same time, an inspiration. I witnessed it, myself, and it was an exciting experience. Bingers, continue reading to find out what went down and how I tested my will! Last Sunday, June 24, I have been invited to cover the third Test of Will by Under Armour at the Mega Fashion Hall in SM Megamall. Before confirming my attendance, I was torn between just being there to cover it or experience it myself! As an adventurous and a mild gym rat that I am, the latter was the obvious choice. I arrived at the event past 2PM, just in time for the second wave. Before that, I dropped by Pound for Pound Fitness in Makati to condition myself and to do my regular Sunday circuit routine. We got it on at Under Armour Test of Will 2018. A workout before a workout? What was I thinking, right? I just had too much energy from the other day to burn. Going back, after signing up and meeting with the organizers who invited me, I dropped by the area where participants can get a rundown of the activities that they will be doing. A coach taught us the proper way of doing the exercises that we will be doing on ground. Over and Under, Deadball Squats, Kettlebell Farmer Walks, and Bear Crawls- those were the four exercises that we had to finish in one minute each. The fitness buff in me got a bit cocky because, well, these are part of my regular circuit routine at the gym. I workout five times a week so these should be a breeze. That’s what I thought. The challenge aimed at pushing each participant to their limits. So I got a little surprised when I found out that they will be weighted. Just a quick fun fact: circuit workouts mostly rely on bodyweight. I am a Willbreaker, Bingers! Taken during Under Armour Test of Will 2018! Did I quit? Of course not! Because I am what? A Willbreaker! When I got to the venue last weekend, I felt a bit of insecurity. Toned and super fit individuals were everywhere! But that is what the Test of Will is all about. It is open to every type of participants who wanted to showcase their fitness skills and test their willpower. 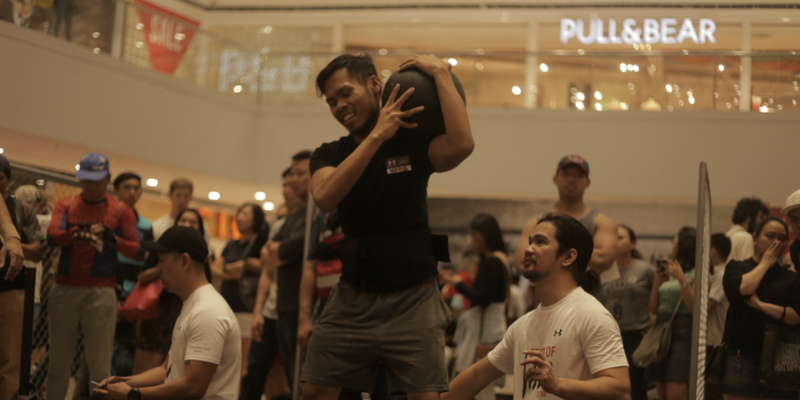 The event celebrated Filipinos’ endurance performance, functional fitness, and training lifestyle. Weighlifters, crossfitters, and circuit trainers like I am took the test! We were diverse but we all had one thing in common- the will to train and a drive for competition! This year saw several changes to the Test of Will. From #IWill in the previous years, Under Armour now embraced #WeWill to enforce its “Together, we are stronger” battle cry. And to be honest, I felt that! I, like the rest of the participants, signed up to compete but they kept on reminding us that we have to compete with ourselves and not with the other participants. Also, age categories for 18-34 yo, 35-44 yo, and 45 yo and above were introduced this year. While a sense of competition and empowerment filled the air, it was still a contest. So, by the end of the event, the top male and female for each categories got rewarded with a limited-edition Test of Will 2018 medal and cash prize. Meanwhile, every finisher received an exclusive “WILLbreaker” t-shirt. You know what? I will be honest. My willpower is strong but my confidence is not. I accepted early on that I will not be the top challenger. But hey, I did not go for the prize. I was after the sense of accomplishment and the bragging rights! There was this sense of fulfillment after testing my will and proving to myself that I am in fact, a willbreaker! Watch our quick recap on IGTV!